At 9:00 am, Washington arrived from Manhattan. Around this time five British ships attempted to sail up the East River to cut off any possible American evacuation but the wind had shifted and they were unable to do so. Washington realized that he had been wrong about a feint on Long Island and he ordered more troops to Brooklyn from Manhattan. Washington's location on the battlefield is not known for sure, because accounts differ, but most likely he was at Brooklyn Heights where he could view the battle. On the American right, to the west, Stirling still held the line against Grant. Stirling held on for four hours, still unaware of the British flanking maneuver, and some of his own troops thought they were winning the day because the British had been unable to take their position. However, by 11:00 am, Grant, reinforced by 2,000 marines, hit Stirling's center and Stirling was attacked on his left by the Hessians. Stirling pulled back but British troops were, at this point, coming at him in his rear too. The only escape route left was across a marsh and a creek which was 80 yards wide, on the other side of which was Brooklyn Heights. Stirling ordered all of his troops, except 250 Maryland troops, to cross the creek. 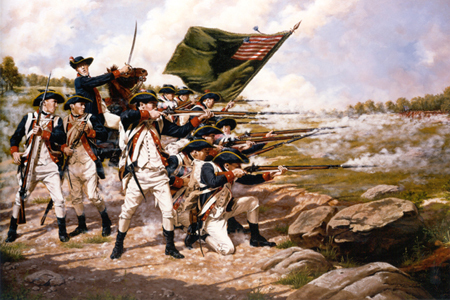 The 250 Maryland troops attacked the British, trying to buy time for the others to withdraw. Stirling led the 250 men in six consecutive attacks against the British, until the detachment was annihilated. Washington, watching from a nearby hill, was to have said, "Good God, what brave fellows I must this day lose!" Stirling ordered the rest of his men to get back to the Brooklyn lines any way they could. Some of the men who tried to cross the marsh were bogged down in the mud under musket fire and others who could not swim were captured. Stirling was surrounded and, unwilling to surrender to the British, broke through the British lines to Von Heister's Hessians and surrendered to them. Although the troops did not want to stop advancing, Howe ordered all of his troops to halt, against the wishes of many of his officers. Many of his officers believed that they should push on to Brooklyn Heights but Howe disagreed, and the battle ended. The Americans listed about 1,400 casualties from the rout on Long Island. The British toll numbered fewer than 400. This embarrassing display was observed by a helpless Washington from atop Brooklyn Heights. For the next two days, he and his army expected a British assault, an event that would most likely had led to a decisive British victory. During this period of quiet, the weather was unseasonably cold and a steady rain fell; American morale was at a low point and many soldiers talked of surrender. General Howe had made good use of his time on Long Island. The eventual British attack was carefully planned and gained the success it deserved. On the evening of 26 August the main force moved east towards Jamaica Pass, using back roads to avoid being detected. General Henry Clinton led the van, Lord Cornwallis the reserve and General Percy with Howe the main army. At three in the morning on 27 August the British surprised and captured the five American guards at the Jamaica Pass and without any difficulty were behind the American lines. They now began a quiet march towards Brooklyn, hoping to trap the American forces on the rest of the Heights of Guan. They were aided in this by two diversionary attacks, both also launched at about three in the morning. On the American right, where the Heights reached the coast, General James Grant launched a diversionary attack, which convinced the commander of the American right, William Alexander, ‘lord’ Stirling (his claim to the title had been rejected) that the main attack was about to come. Further along the line, the Hessians bombarded Sullivan’s forces, pinning them down half way along the Heights. The main assault began at nine in the morning. The main British force reached Bedford village, behind Sullivan’s position, and opened fire. The Hessians also attacked up the pass and Sullivan’s command collapsed. The main American resistance came from Stirling on the American right. His Maryland and Delaware Continentals had only arrived on Long Island on the previous day, but fought doggedly for two hours. Reinforced by units from Connecticut and Pennsylvania, Stirling held on until he was almost surrounded. Finally, he ordered a retreat and the bulk of his men escaped across the marshes around Gowanus Bay, remaining behind with a rearguard of to 250 Marylanders to cover the withdrawal. By noon, Howe’s men had captured the Heights of Guan, and forced the Americans in disarray back into their positions around Brooklyn village. The Americans were now very vulnerable, and Howe’s men were keen to finish them off, but once again Howe held back. 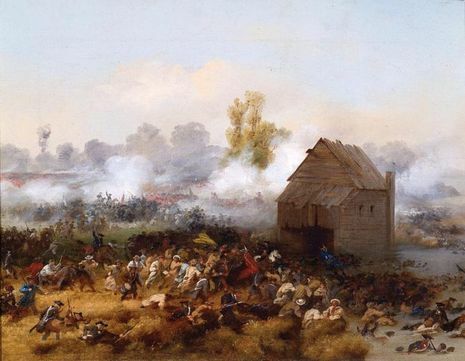 28 August saw Washington send three more regiments into Brooklyn, while Howe began to build regular siege works. 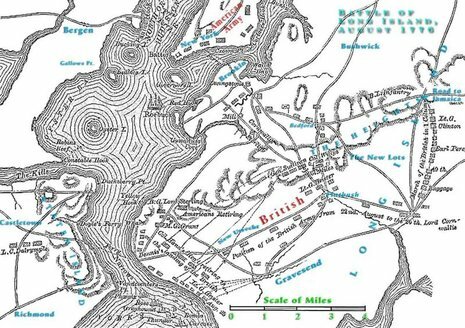 Bad weather prevented the British from blockading the Brooklyn position from the sea, but also gave them the idea opportunity to use their superiority with the bayonet against the demoralized and outnumbered Americans. Once again, Howe declined to push his advantage, and finally on 29 August Washington came to realize that his position on Long Island was untenable. That night the 9500 American soldiers apparently trapped at Brooklyn were evacuated by sea to Manhattan Island.